Over the past few days, Ebay seller fzwlcmfyr has listed over 50 auctions for the Steel Brigade Delta v1. Originally included with the 2011 30th Anniversary VAMP Mk II, the Steel Brigade Delta proved to be a surprise hit with fans– to the point where the Collector’s Club released their own version as part of the 2014 Zombie Initiative convention set. However, for troop builders the figure has proven to be a bit more challenging to acquire. 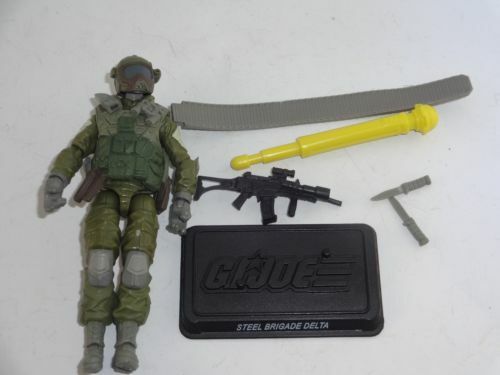 The auctions on Ebay appear to be for complete figures– and include the figure’s helmet, rifle, and two combat knives as well as a figure stand. (Also included is the VAMP Mk II’s ammo belt and firing projectile.) Most of these figures are currently listing under $11.00 which is a significant price drop from the prices they’ve been closing for in recent months. So, if you wanted to stock up on this troop builder and still now blow your Holiday budget, now is your chance! Check out the auctions while they’re still active and good luck! This entry was posted in Toys and tagged 1:18 scale, 2011, Ebay, Hasbro, Pursuit of Cobra, Steel Brigade Delta, Toys, VAMP, VAMP MK II by Fred Meyer. Bookmark the permalink.